Ready to Retire Collection. Pale blonde-grey and strangely glossy due to a lack of cartwheel luster, the overall appearance is somewhat flat, although certainly not offensive given the cataloger's "cleaned" disclaimer. 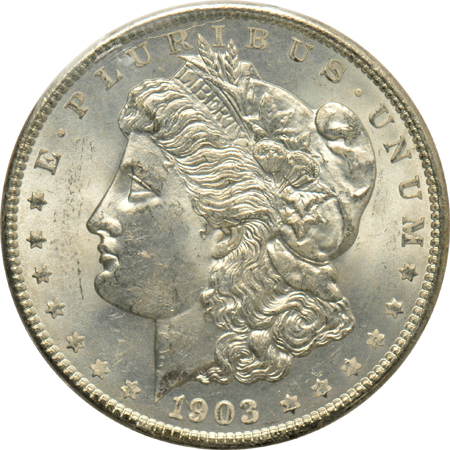 At least there is no distracting damage, and the reverse sharpness is something to behold for an 1893-O, even if the obverse is about typically struck. 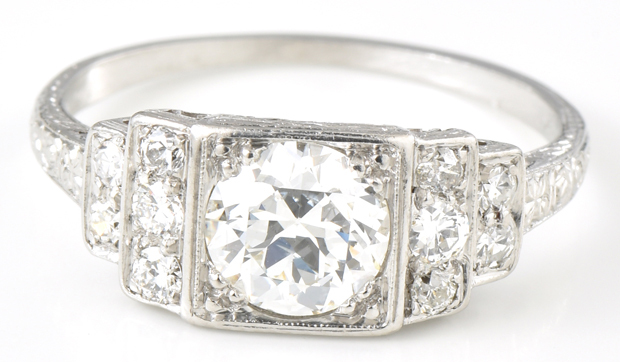 This elegant vintage diamond ring centers on an approximate 1.05 ct. old European cut round diamond, SI1 clarity, I color set in a square style mounting that sits flush with the ten side diamonds that weigh approximately .35 cttw, SI1-2 clarity, H-I color. Ring size 8, 2.7 dwt. Clem Stevens Collection. 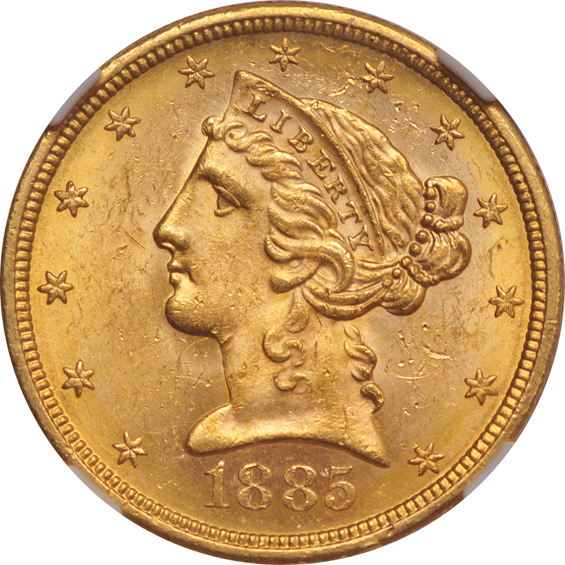 Includes the following PCGS MS-65 examples. 1946-D, 1947-D, 1949, 1950, 1952, and two 1956. The remaining years are all PCGS MS-66. They include: 1946-S, 1947-D, 1947-S, 1948, two 1948-S, 1949-D, 1949-S, 1951-D, 1953-S, 1954, 1955, 1955-D, three 1956, 1957, 1957-D, 1958, three 1959, 1960-D, 1961-D, 1962-D, and 1963. That these are hand-signed significantly adds to the appeal of this memorable run of five consecutive 1935-Cs. While all are ChCU, the cataloger does feel compelled to footnote a modest bend at the top right corner of these stacked notes. For that special crab in your life! 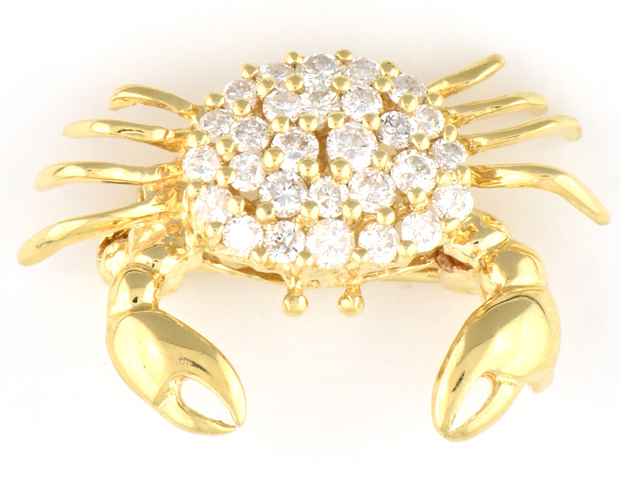 Just kidding, but this is one seriously cute crab pin. There is approximately .90 cttw in brilliant cut round diamonds, SI2-I1 clarity, G-H color. Dimensions 1” x .75”, 2.3 dwt. Small 'D'. 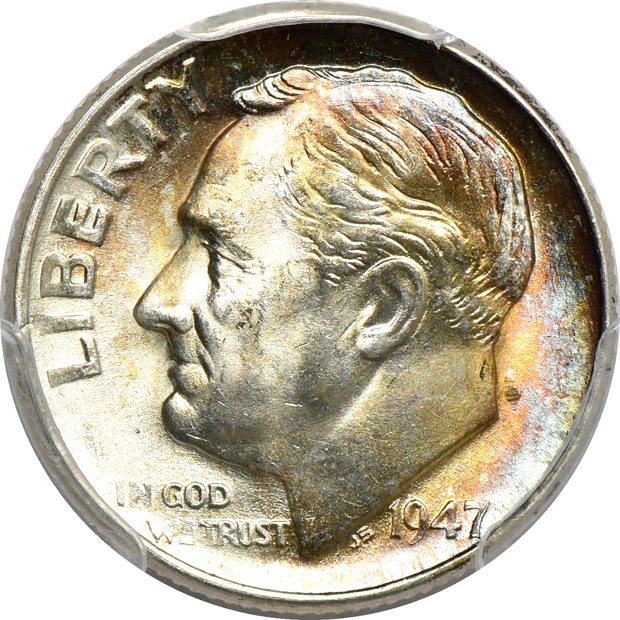 While obviously greatly surpassed in value and scarcity by its San Francisco counterpart, the 1934-D is no slouch at the gem grade, and the present example adds a phenomenal level of enticement given the exceedingly rich tobacco-grey and russet toning blanketing the whole surface. 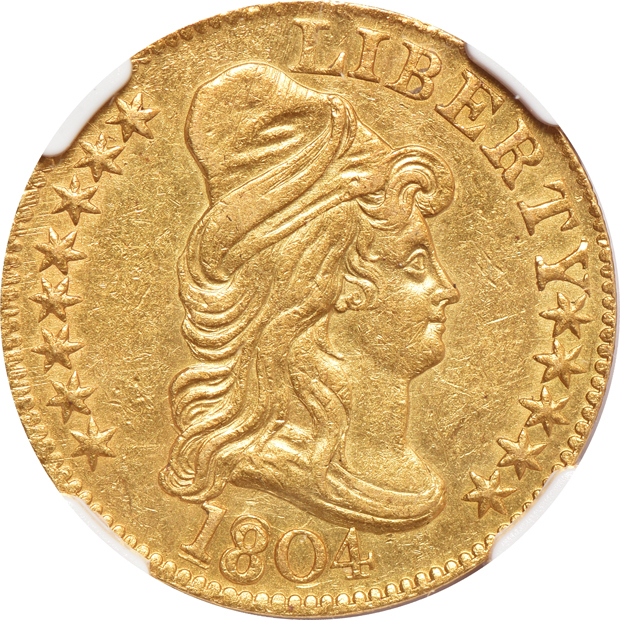 It is as if the coin had just been plucked out of a cardboard mint-set holder. 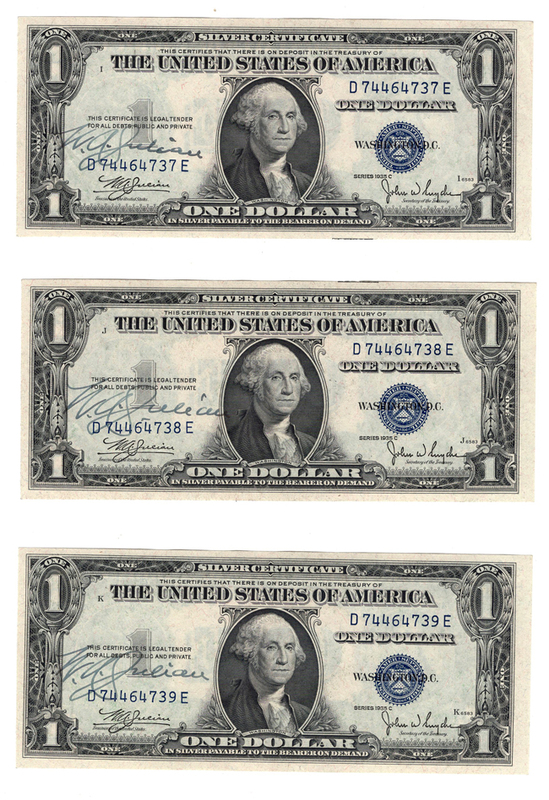 Truly one for the collector who loves fully original dollars. Curiously attractive, the semi-flashy low-points of the fields contrast beautifully with dandelion accents on the highpoints. Exceptionally sharp and frosty-fresh, as if just picked out of an album collection. Before you buy your next PowerBall tickets, think of the lottery as a special tax on people who are terrible at math. 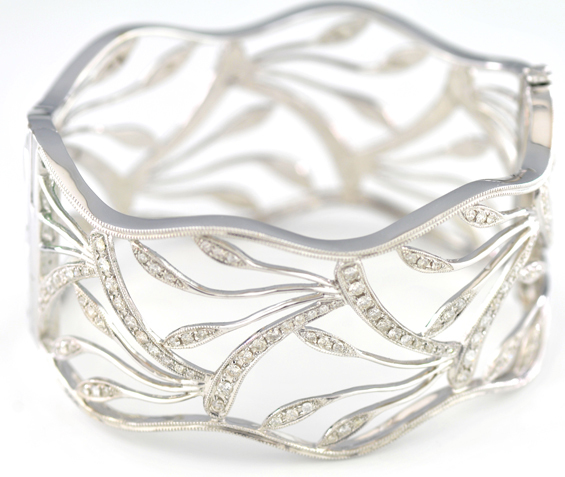 Here we have a wide bangle with a lovely open vine-like design containing roughly 1.50 cttw of brilliant cut round diamonds with SI2 quality, I color. The piece measures 1.25” wide and fits an average sized wrist. 26.6 dwt. Toast-gold layers much of the obverse field. 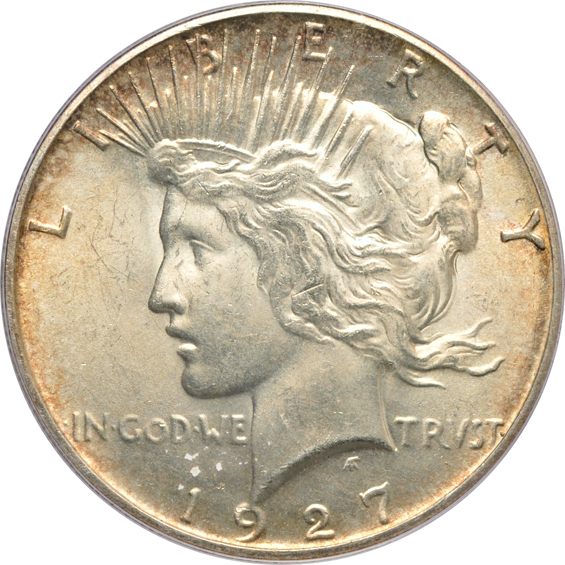 The reverse shows delicate golden-grey with a strong, narrow band of midnight-blue around the lower rim. Redfield holder. 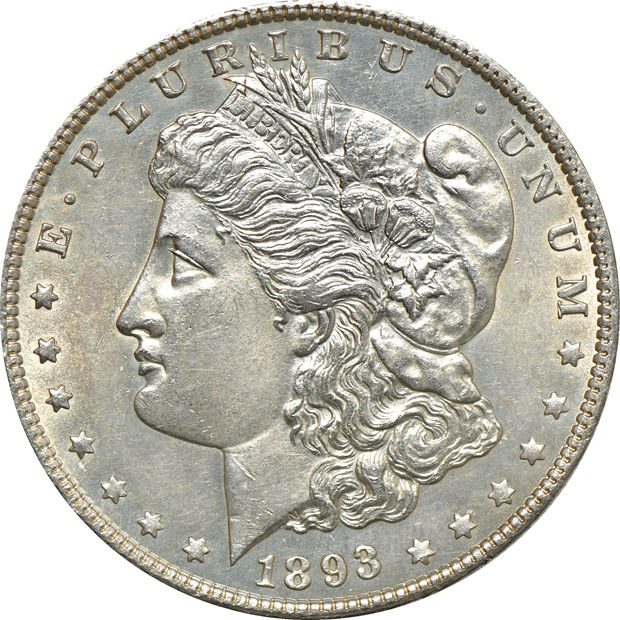 Prior to the release of a hoard from the government vaults, 1903-O was considered THE key to the Morgan dollar series, and even today, it commands a premium despite a sizable number of GSA-derived examples on the market. 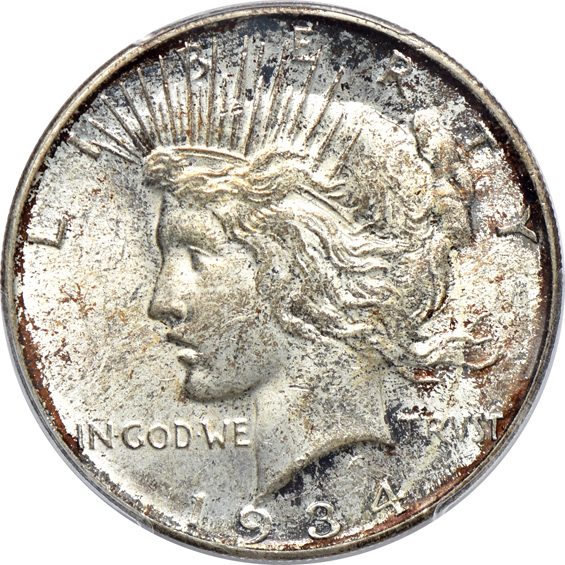 As is the case with all soft-pack dollars like this, the enclosed "poker chip" states "circulated", although the coin ought to easily grade MS-62 today, as it is replete with flashing white luster and a few tiny abrasions.